We had a game of the week that we were covering, along with other major area matchups. We were able to collaborate our games altogether and provide a stream that kept us up to date with what else was happening across our area, and how it affected our game of the week as far as standings. Our initial setup was difficult, and we had to work around other workers who are technologically impaired, per se. The support team provided to us was mostly unresponsive, but we managed in spite of it. Collaboration - It doesn't portray itself as a high-definition video platform. Most times it is accessed with webcams. But a strong focus has always been on its collaborative nature. Allowing for a wide range of materials to be shared with other viewers, it can be used for information collection as well as distribution with input coming from any user. Communication - With a large portion of businesses looking to hold larger meetings allowing a greater portion of their employee base to take part in a meeting that might have once been local, or required people to be flown in, it provides a simpler means to gather information from many locations all at once - globally. Cost - Many businesses are looking to cut costs from their events, and Adobe Connect is an ideal platform to help the bottom line. With one installation, you have now a perfect place for meetings to be held around the world without the costs of hotel rooms, conference areas, food and travel. Your users don't even have to get dressed if they don't want to. information is passed on with only a click into a meeting room. LifeSize happened to be one of the solutions we were able to pitch in easily, as it moved from a complete H.323 system to a cloud solution thanks to the Lifesize cloud. This allowed users to do their Video Conference calls without spending additional money on dedicated lines for your Video Conference. Adobe Connect must improve its implementation in the mobile part, since its operation in these devices is very limited. I would like to be able to paste an image on the board and get better results when I paste a text, sometimes I have difficulties to adjust all the pods I want to use on the screen (discussion, chat, video, area to share). I would like that Adobe Connect had a little more functionality, that is, that you could play music in the lobby, serial a great compliment for this application. I dislike that they are no longer making the Team/Room 220's. I am not a fan of the Icon editions that are replacing the Team/Room 220's for my classrooms and conference rooms. I do not like, when I remote into the codecs, that the layout is very limited compared to the Team/Room 220's. I can no longer see if someone is in the room or able to access the remote control or adjust the cameras. Because we are not using the "Cloud" with our codecs, users are no longer able to access a directory. The remote control looks almost like the Apple TV remote, which has very few buttons with no labels on it. My users, who are not very tech savvy, would rather not use the equipment unless some else sets it up for them. Software for computers could be more robust. One thing I would like to see is a way to click on one of the video streams to just see it large and be able to toggle which screen I want to see myself, instead of the software deciding which one should be the focus point based on who is talking. I give Adobe Connect an 8 because there have been prior issues with connection and recording in the past, but Adobe customer service has been very on top of things and were able to remedy the situation, but after the fact. Otherwise, it's a good service and should be taken advantage of. Other than the HIPAA compliance, we have no compelling reason to retain LifeSize when we can already pay for similar services included with our UCaaS service. 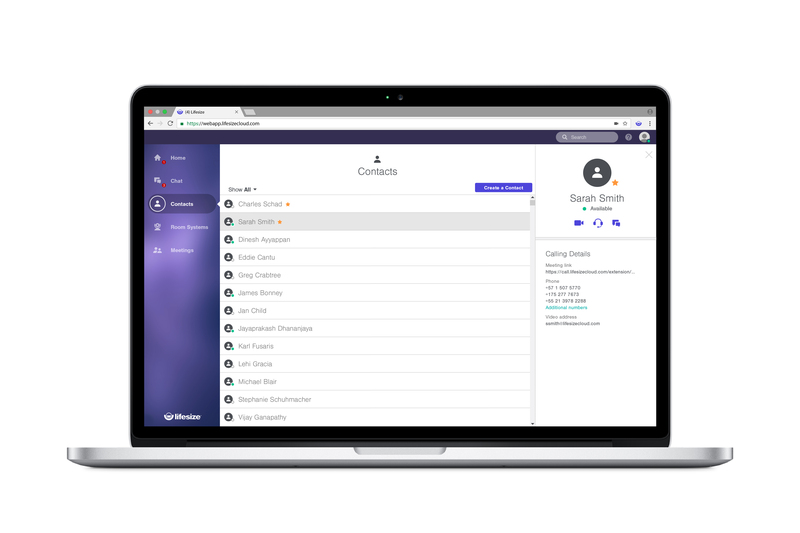 Our UCaaS vendor, Fuze, includes video conferencing with the VoIP services via single, integrated client software package. Additional limitations include minimal implementation assistance, training service, training materials and assistance driving internal adoption. Issues with slow speed for desktop sharing and audio quality make the technical aspects of Lifesize inferior to competitors. Very easy for new users to get the hang of. We chose Lifesize because we are in a consortium with several other small universities. Each university has its own LMS and professors and IT departments each either provide or allow users to use additional tools or programs. Additionally, as our staff members use Lifesize to communicate with those outside our system we must have a tool that is capable of integration with what is being used by our faculty and staff as well as those they interact with in the course of their academic business. I rarely call with a problem. When I do, I get an answer very quickly. Solid platform, easy to use, bit pricey. The implementation was pretty easy and fast, You can do it with your internal team and it should not be any problem. Integration with other software is also pretty easy. But, if for some reason you have any issues with implementation or integration you can contact Lifesize Video Conferencing support team 24/7. The best part of Adobe Connect is sharing the information with others who use this software. If you attend school and love taking notes through your iPad or Computer, you can share what notes you are writing with everyone in your classes. Also, it is a great virtual meeting place. We evaluated BlueJeans, Google Hangouts (Chromebox for Hangouts), Biba, and Cisco. Lifesize had the absolute best in-room and out of box combined experience. I can literally ship a unit across the world and in 3 questions the unit is on Lifesize Cloud, in the directory, and ready to go with minimal involvement from my team. It's pretty impressive the number of people the system can support both in total and per conference. The system handles large numbers of connections pretty well, although there's little control over how participants are displayed on screen. One of its greatest strengths is adding large number of both video and audio connections simultaneously. ROI is clear - video meetings are engaging and save travel.